If you’ve started WCS within the last year, at some point you’ve probably felt scared or intimidated. West coast swing is a really fun dance, but it can also seem unapproachable. If you’re a beginner and you feel overwhelmed, I want to reassure you: you are doing just fine. Beginners tend to be down on themselves when they start learning about how complicated WCS can be. 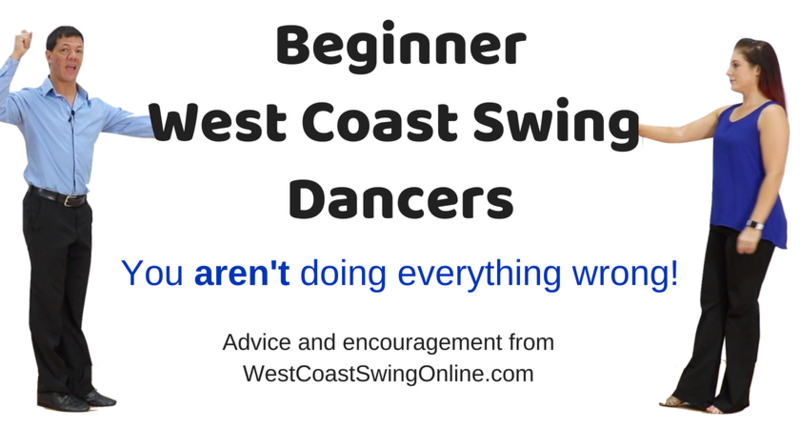 As a community, west coast dancers can unintentionally make that feeling worse because everyone has a slightly different way of explaining even basic steps like a whip or anchor. When beginners go to a larger event and hear top pros telling them that they are dancing their push breaks wrong, or that they aren’t anchoring properly, or that they’re off time, it can be easy to feel like you’re doing everything wrong. There’s no such thing as a perfect dance. Even the pros, who have their own interpretation of what the dance should be, never find that perfect push break. This is an art rather than a science, and there’s no pass-or-fail grade. You can have fun no matter what level you are. If you had to be great in order to have fun, no one would stay in the activity long enough to actually become great. There’s no reason you can’t enjoy dancing as much today as you did when you first caught the bug. You are getting better, literally one step at a time. This is particularly true when you feel lost because you just heard that you’re doing something wrong and now everything feels awkward. That awkwardness is your body trying to make sense of new information, and if you stick it out you’ll emerge even better. The bottom line for beginners is that you’re getting mixed messages. Want a step by step guide to go from Beginner to Intermediate? It’s a 18 video series to move you from a beginner to a confident Intermediate Dancer. PS want some of my best WCS videos sent to your inbox? Over 10,000 WCS dancers get our ‘Move of the Week’ videos. People love them and so will you! Pinky promise 😉 Sign up below!